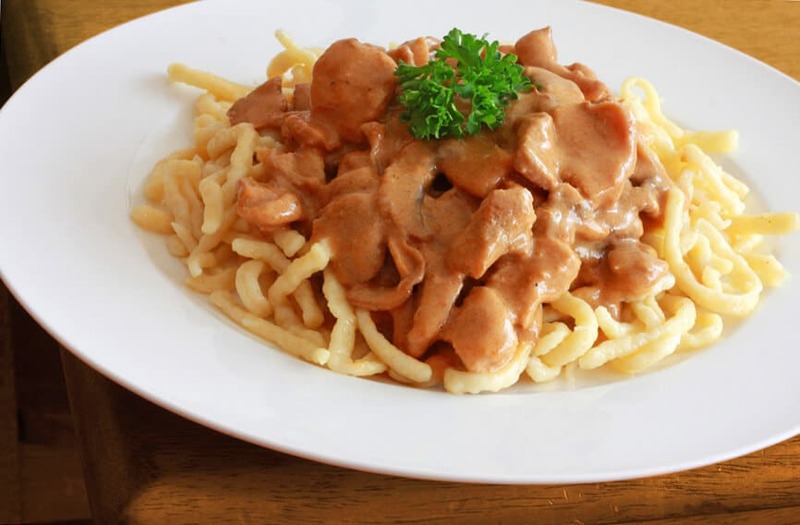 Geschnetzeltes (prounounced geh-shnet-sel-tess), German for “sliced meat”, is a sauce with pork or veal, mushrooms and cream that is popular throughout Germany and Switzerland, some versions named Züricher Geschnetzeltes. Traditionally served with Spätzle, egg noodles, or even boiled potatoes, it is a thoroughly delicious comfort food dish. Ideal for the busy cook, it only takes about 30 minutes to make. You’ll need about a pound of lean pork. Heat the oil in a stainless steel skillet over medium-high heat. When the oil is heated, add the pork, being careful not to overcrowd, and brown it on all sides. Browning the pork will ensure a rich flavor in the finished sauce. 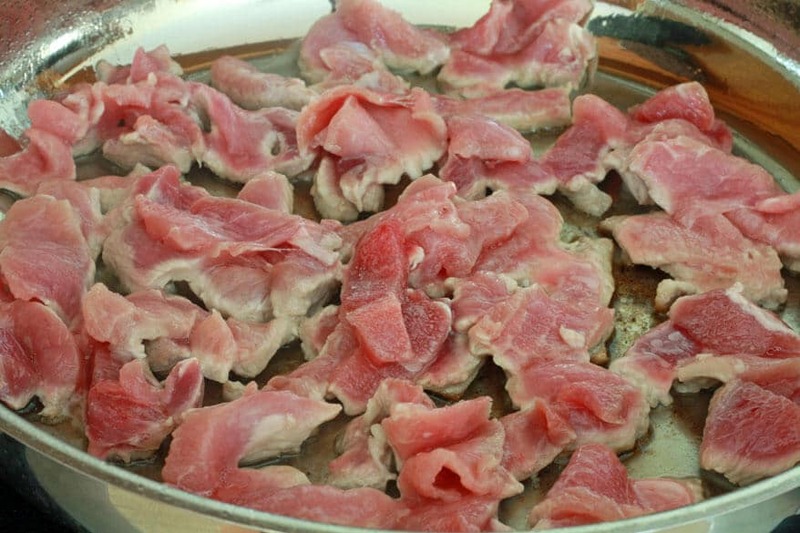 Transfer the pork to a plate and set aside. 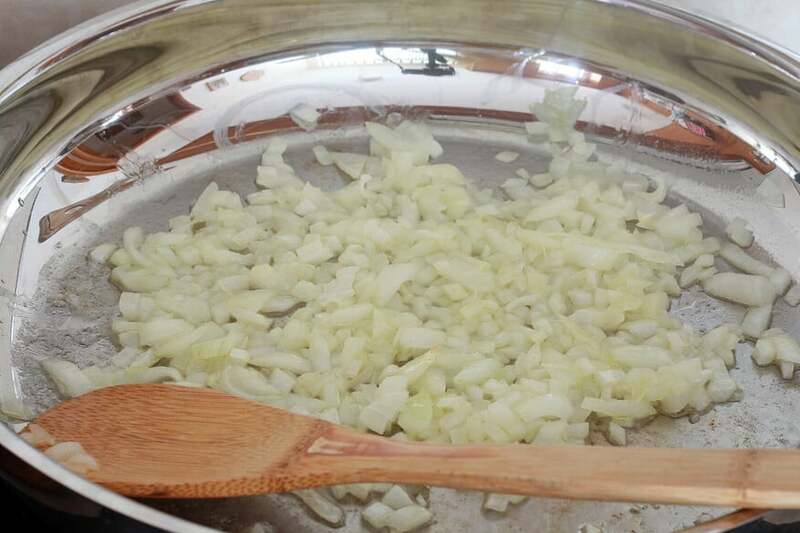 Add the onion to the skillet, adding more oil if necessary, and saute until translucent and beginning to brown, about 5-7 minutes. Add the mushrooms to the skillet with the onions and saute until tender, about 5 minutes. 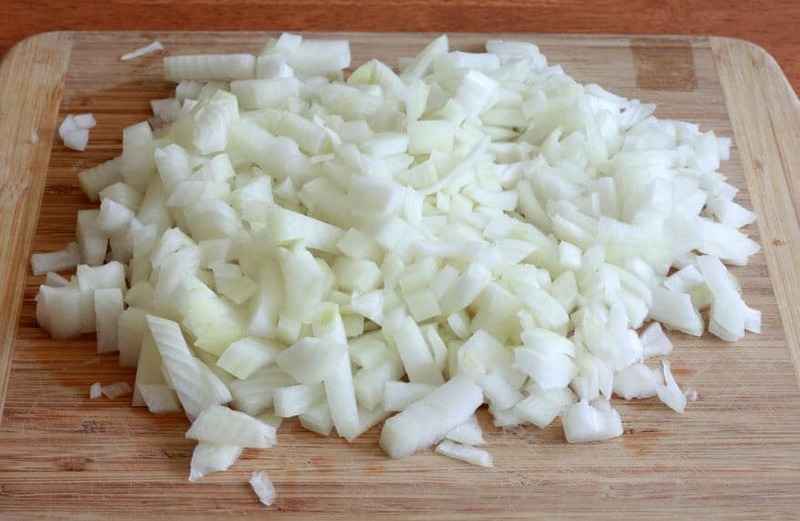 Transfer the onion/mushroom mixture to the pork and set aside. 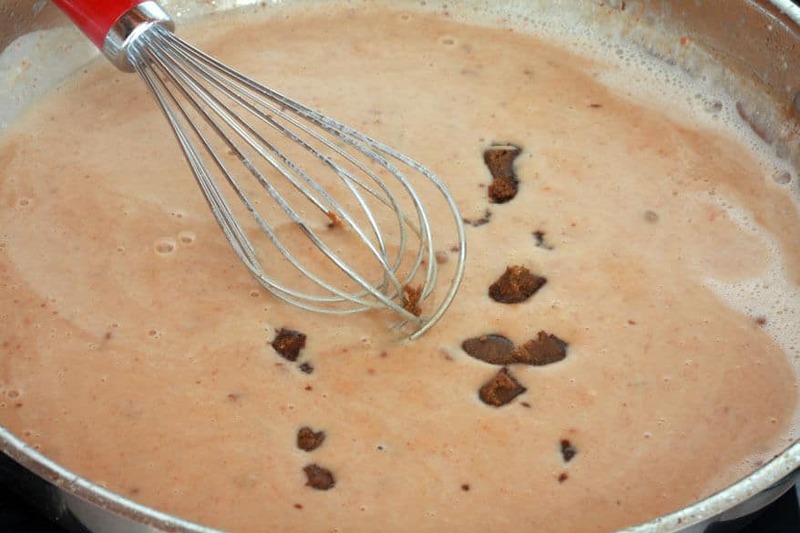 Continue to whisk constantly until the mixture is a rich caramel brown. 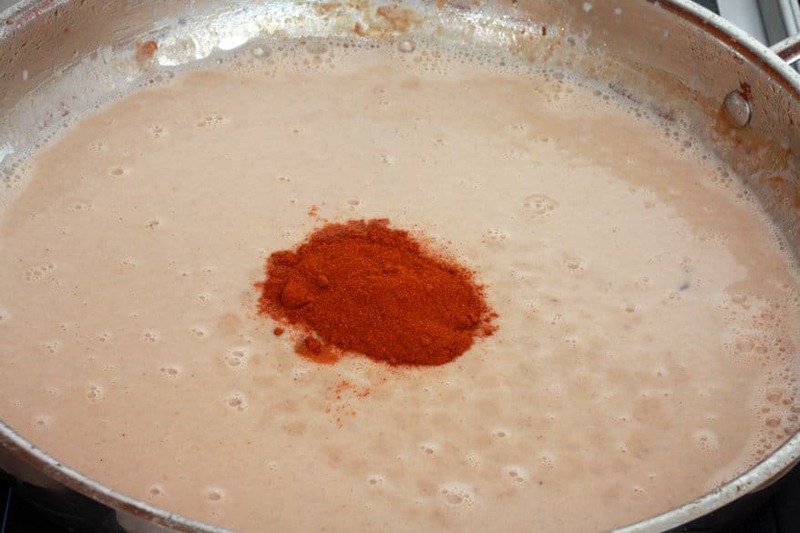 Add the milk and cream and whisk until smooth and thickened, then add the paprika. Add the beef bouillon and whisk until combined. 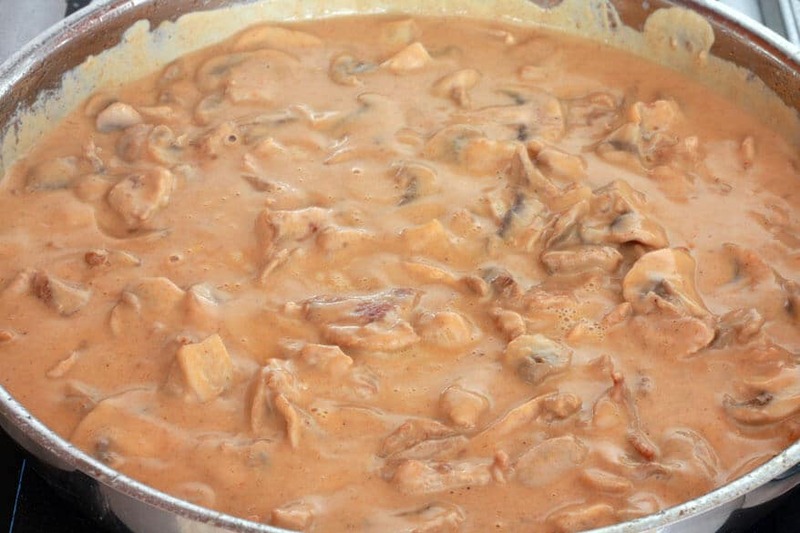 Return the pork/onion/mushroom mixture to the sauce, bring to a simmer, reduce the heat to low, cover and simmer for 15 minutes, stirring occasionally. Serve immediately with Homemade German Spätzle or with hot egg noodles cooked according to package instructions, and with a fresh green salad. Geschnetzeltes is a popular German dish for the busy cook. 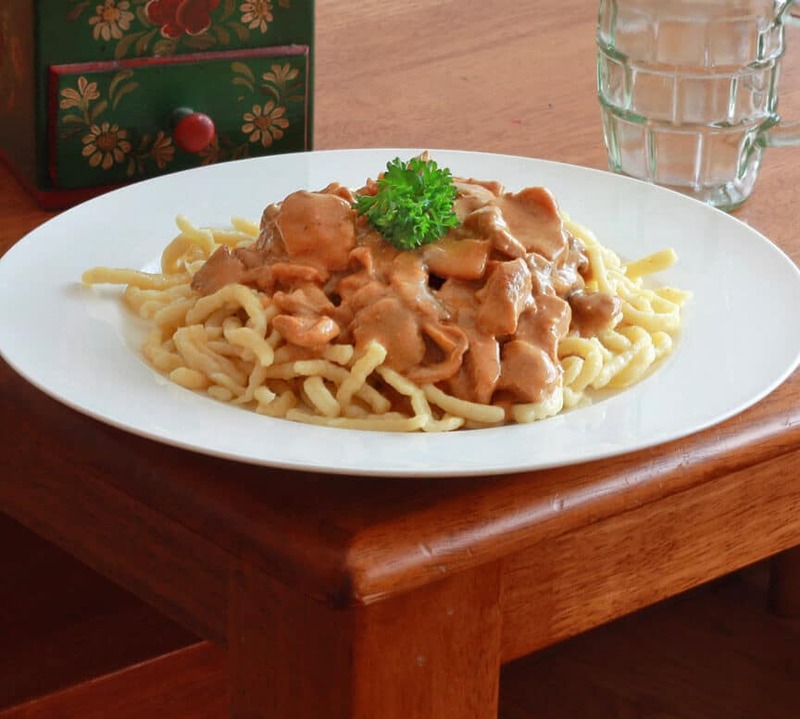 A creamy sauce with pork, mushrooms and onions, it is traditionally served with Spaetzle, egg noodles, or potatoes. Spaetzle, homemade or purchased and cooked according to package directions. Or 1 (16 oz) package egg noodles cooked according to package directions. 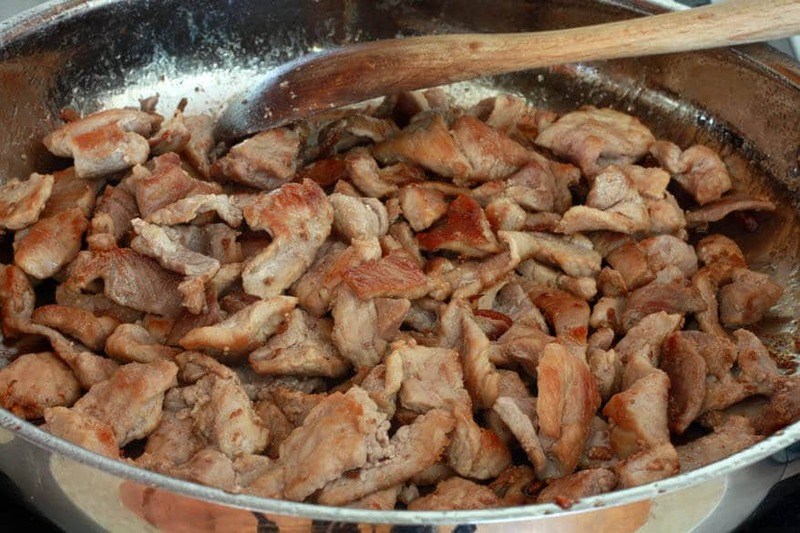 Heat the oil in a stainless steel skillet over medium-high heat and brown the pork on all sides. 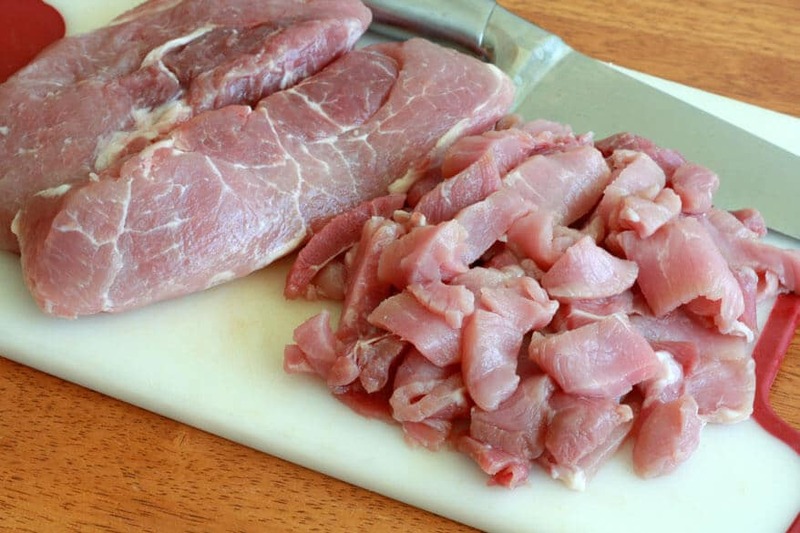 Transfer the pork to a plate and set aside. Add the onions to the skillet, adding more oil if necessary, and saute until translucent and beginning to brown, about 5-7 minutes. Add the mushrooms and saute until tender, about 5 minutes. Transfer the onion mushroom mixture to pork and set aside. 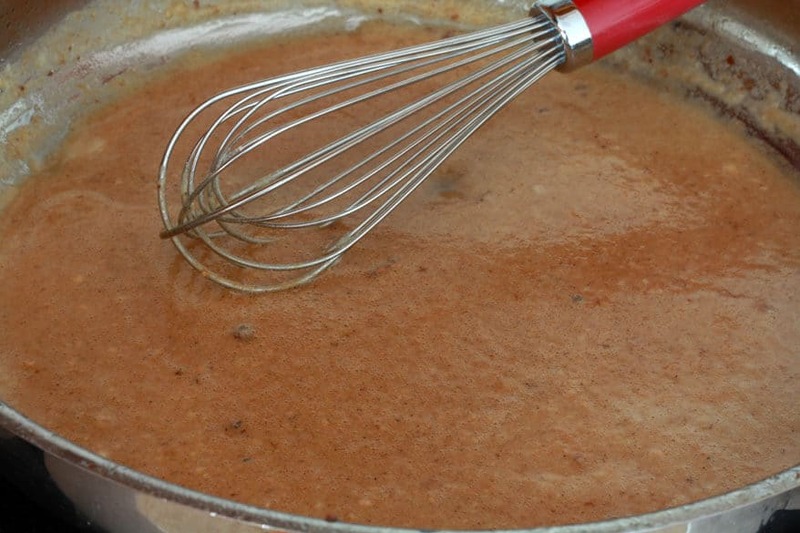 Melt the butter in the skillet and whisk in the flour, continuing to whisk until the mixture is a rich caramel brown. Add the milk and heavy cream, whisking continually, until the mixture is smooth and thickened. Add the paprika and crumble in the beef bouillon and whisk until smooth. Return the meat mixture to the sauce and bring to a simmer. Reduce the heat to low, cover, and simmer for 15 minutes. Add salt and pepper to taste. 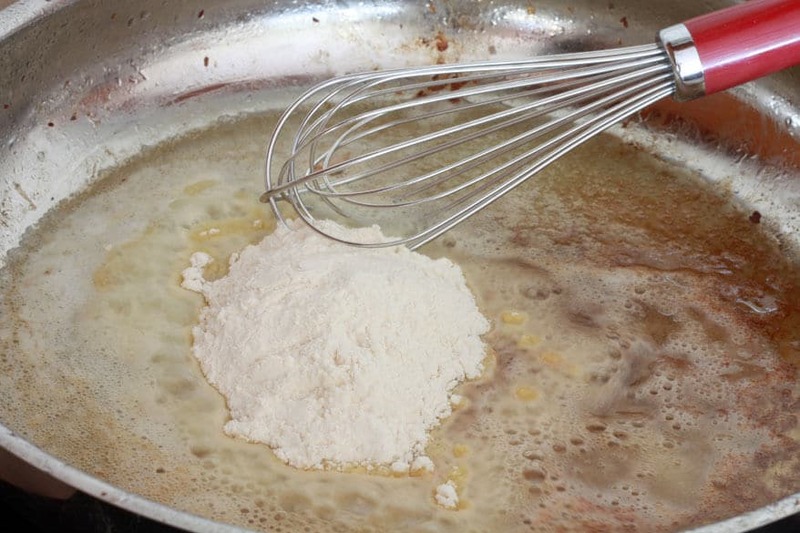 Add more milk if the sauce is too thick, or add a flour slurry to thicken. Serve immediately with hot spaetzle or egg noodles and a fresh green salad. this sounds like a delicious, hearty meal! Thank you! It truly is. Good German comfort food. Thanks for visiting! When do you add the heavy cream? Thanks for noticing that! I had it in the pictured instructions but not the recipe box – it’s now updated. Add the cream along with the milk. In step three…where it says add the milk and heavy cream. …What was your question about step 3? OMG, I’m looking for German style mushrooms (like at the Christmas markets) and found this instead! I have to make this SOON!!! oh, yum!!! Thanks, Christina! 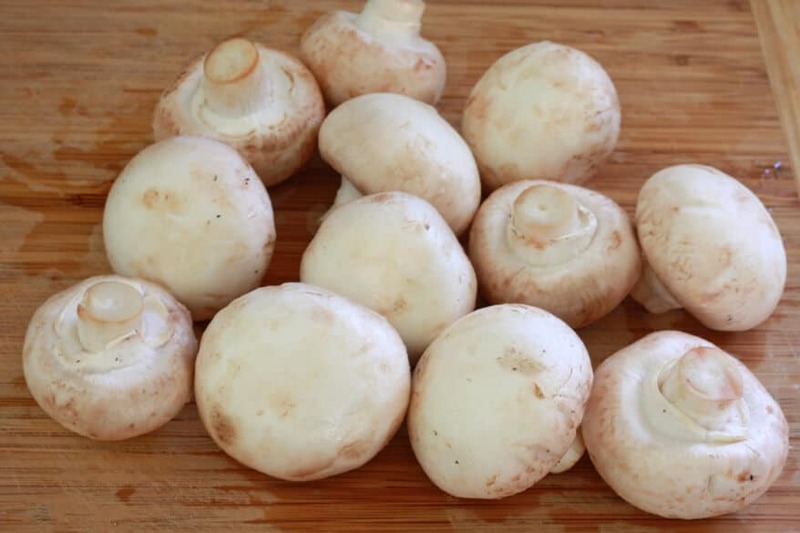 Oooooh yes, these are German mushrooms at their best :) Another popular mushroom dish you’d find in Germany, and a personal favorite, is this Steak with Creamy Chanterelle Sauce. SO good! Chanterelles, called “Pfifferlinge”, are super popular in there. Thanks so much for visiting, Christina! This is the extended family favorite right now! I am getting asked for your blog! I love this and look forward to trying even more dishes of yours. I also love your polenta lasagna. 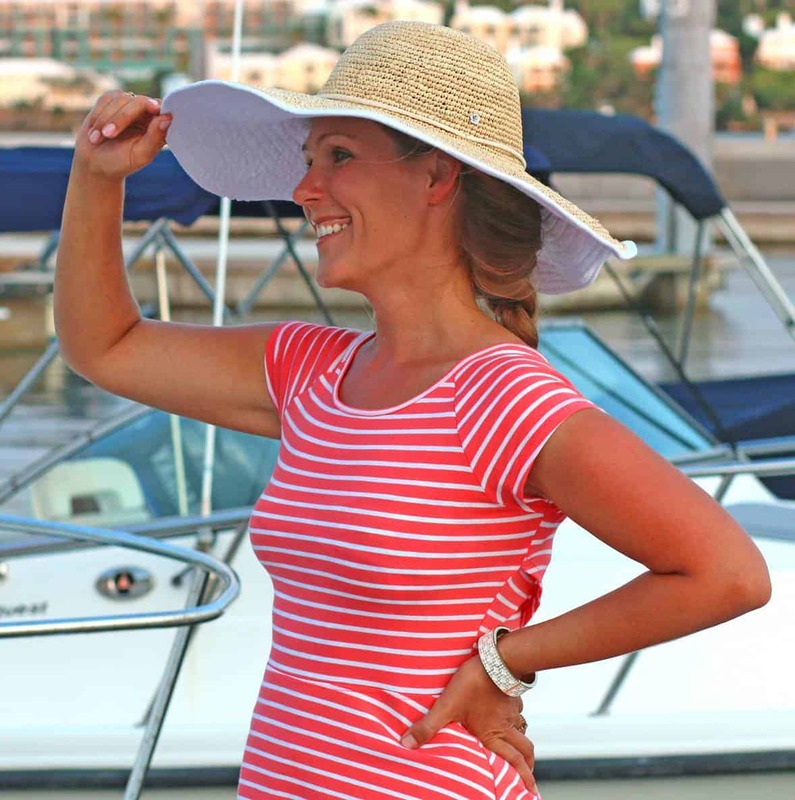 If I had more time, my goal would be to make everything on your site right down the list! What excellent recipes. I appreciate the visuals you include so that I can ensure that stages look right. Thanks for the detail that went into these excellent meals. It really is very delicious! Just last week I had two friends of mine report that they made and absolutely loved it. I hope you give it a try! I just made it and the sauce is out of this world! Fantastic, so glad to hear it! Thanks, No Body! Thanks Kimberley. My wife is German so this will be a treat for her tonight! Wonderful, Glen! Let us know how it turned out. A great recipe, so tasty and hearty. It reminded my wife of a dish her mum used to make so was a link back to the childhood. Thanks Kimberley. Thanks, Glen, I’m so happy to hear you both enjoyed it and that it took your wife down memory lane. Thanks so much for the feedback! If I wanted to use liquid stock instead of a bouillon cube, would I replace some of the cream and milk. Hi Samantha, the bouillon cube is very concentrated and eliminates the need to add a cup of stock. If you substitute a cup of stock for the cream or milk you won’t a very creamy sauce. That’s the downside. Oh my gosh… I love this… my husband loves this… my kids it’s hard to tell, but they are 4 so who really cares. 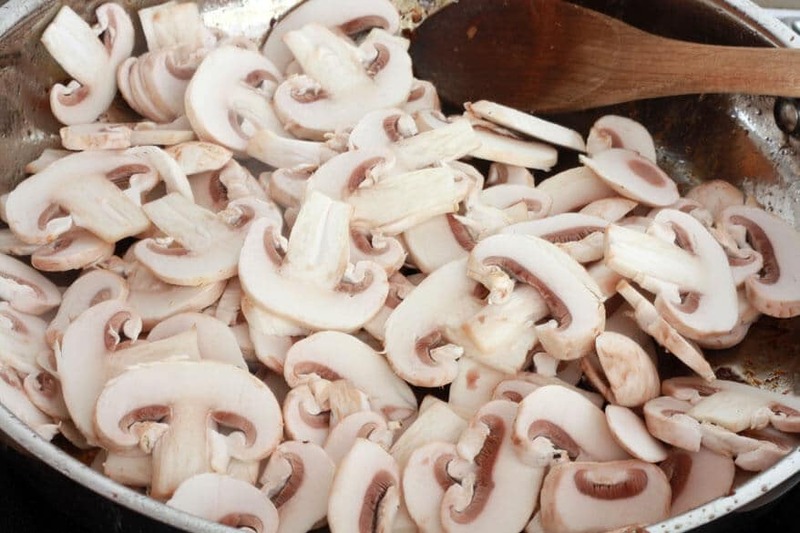 I don’t like the texture of mushrooms, so I halved the amount and it was still fabulous. Thank you so much for sharing this recipe. My heritage is Czech, so I like to find awesome eastern European recipes and pretend their Czech… lol! I’m so happy to hear that, Teri, thank you!! And nothing wrong with a little pretending in the name of bolstering pride in your heritage :) Thanks again! This was absolutely delicious! Made the spetzel, too. Served with spiced red cabbage. Thank you for the recipe, will make this often. We were married in Augsburg almost 45 years ago. A few weeks ago my fiancé bought some porkchops on sale at the store. When she unpackaged them she found that they had buried a very oddly shaped/cut pieces at the bottom. Discouraged, she was about to throw them out saying they wouldn’t cook up right. Then I remembered this recipe. With it, I turned the butchers scraps that were destined for the trash into a meal fit for a king. Thanks again, Daring Gourmet! Good call, Steve! Exactly, traditionally scraps probably would have used for this kind of dish. So glad this dish was a hit, it’s always been a favorite of mine! Fixed this tonight for my German-born father-in-law. Didn’t have equipment to make spätzle, so just served over wide egg noodles. It was fabulous, with everyone having seconds. Only change I made to the recipe: I had 1-1/2 lbs pork on hand so used that amount, instead of 1 lb pork as the recipe calls for. It was not too much meat for the quantity of sauce. A big hit for this German-born and German-heritage family! That’s wonderful, Mary, thanks so much for your feedback! This dish has always been a favorite of mine. We made this tonight with some beef we had in the fridge that needed to be used up. It was excellent! We didn’t have any Spaetzle either so we put it over potato gnocchi which was surprisingly good. That’s awesome, Nate, thanks for the feedback and gnocchi was a great choice! So is the sauce for jaeger schnitzel basically the same just omitting the pork strips? Im looking forward to making a jaeger schnitzel with spatzle for my friends 50rh birthday. Hi Celeste! Yes, it’s basically the same thing. 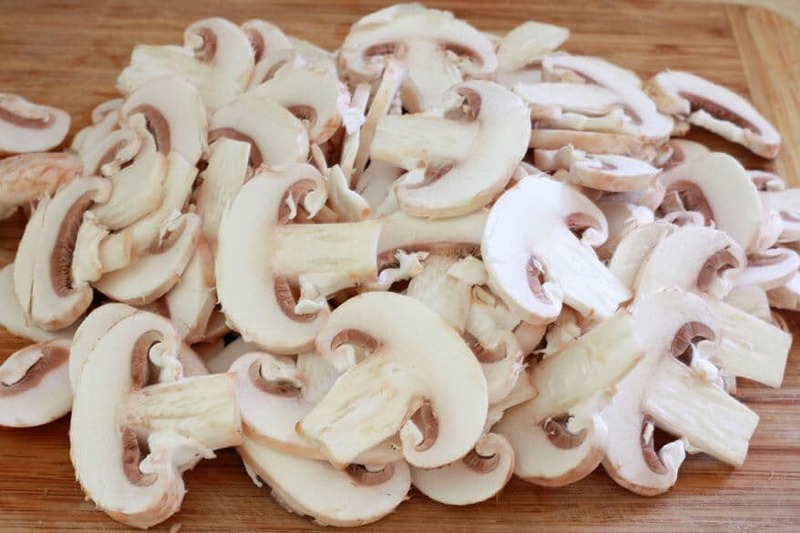 You can make creamy or clear brown gravy mushroom sauces for Jägerschnitzel, both equally popular. I’m actually going to be posting my recipe for Jägerschnitzel in the near future but probably won’t be before your friend’s birthday. You’ll be good to go though making a mushroom gravy as described in this recipe. Thank you so much. Is there a national german dessert you could recommend to finish up this traditional meal? Hi Kimberly, I am German, I grew up in Landstuhl (Rheinland-Pfalz or in English the Rhineland-Palatinate), Germany, which is close to Ramstein Air Base and Kaiserslautern (1. FCK Soccer Club, which has been very disappointing in the past years). My mother was also from Swabia and to be exact, she grew up near Schwaebisch-Hall and my father in Landstuhl. I just want to give you a tip on your Schnitzel with Hunter-style grave and it is also great to use for your Geschnetzteltes recipe. I use the drippings from the meat, add small cubes of bacon and the rest is just about the same as you have in your recipe. I have to say, since I have grown up in a very large or lets say the largest American Military Community outside of the United States, the American bacon is much greasier than the German bacon is. 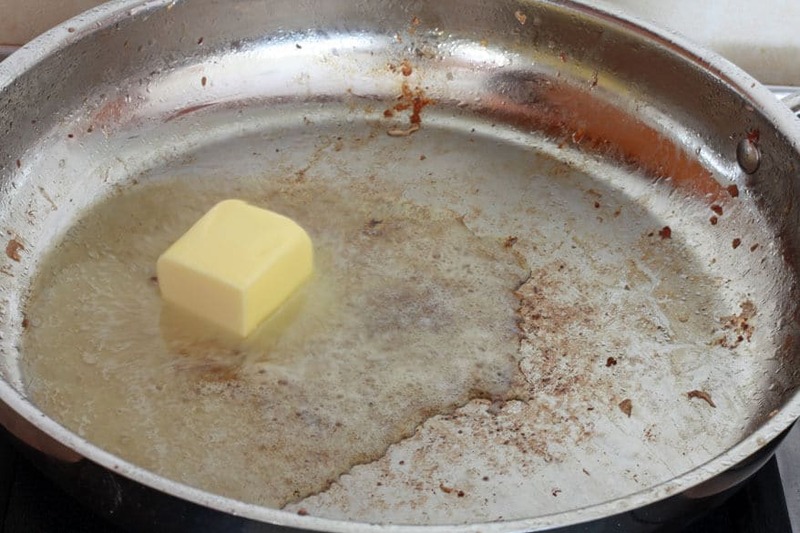 You may want to brown it separately and pour out some of the grease before adding it to the pan of drippings. Let it brown some more and then add the rest of your ingredients. I think you and your admirers/followers will love this little but great change of taste. Hi Doris…AFRC in Garmisch Partenkirchen by any chance? Thats where all my extended “framily” lived and worked. My Uncle was a helicopter pilot there in the ’50s shuttling the brass in for skiing etc. My husband and the rest were there from the late ’70s and some still live there. If that is where you were, “Hi” from our GAPer framily! Hi Kimberly! What a greaat idea! I am cooking for a very large group-a memorial. Many people lived in Bavaria for at least part of their lives. I wanted to to jaegerschnitzel since it is such a favorite but too difficult for a group. This is perfect! 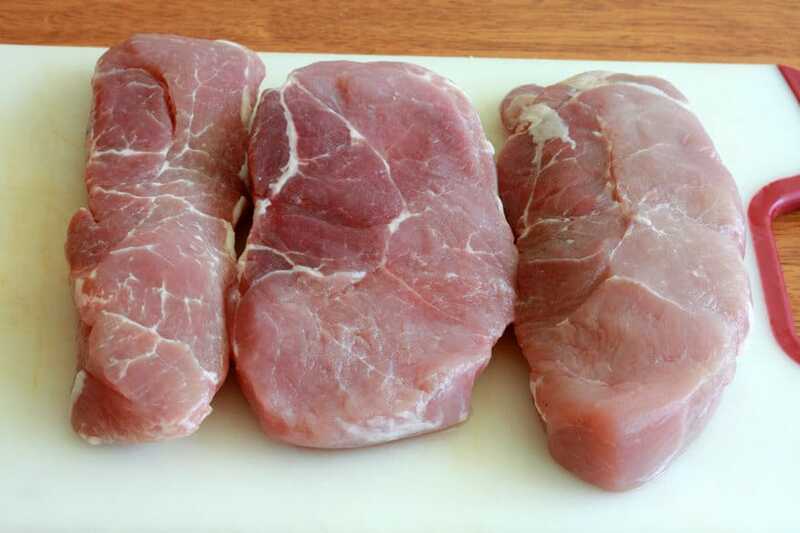 Question: Do you think there would be any benefit in coating the pork pieces like for schnitzel? Hi Christine, what a wonderful memorial! Yes, this is a great dish for a crowd because it can be made in advance and reheated. No, I wouldn’t recommend coating the pieces of pork for two reasons: One, frying/browning the pork is key to the flavor of the sauce and two, the breading would just get soggy and probably fall off in the sauce anyway. Happy cooking and I hope the memorial will be as special as it sounds. Wonderful, Charles, happy cooking and let us know what you think! This recipe looks amazing!! I’m going to try it for sure! When you say heavy cream?…what percentage is the cream you use? I’m also going to make sweet and sour red cabbage salad (served hot) to eat along side … It will be a perfect match for your recipes. Thanks, Karen! Heavy cream typically has between 36-40% milk fat, but you can use a lighter cream too if you prefer. Is the sauce similar to what would be used for Jagerschnitzel? It is, Mark, though the sauce for Jäegerschnitzel usually isn’t creamy, it’s a brown sauce. Kimberly, we have a very close friend from Germany and over the years we’ve enjoyed many Swabian dishes. I made the pork schnitzel recipe of yours and this sauce. It was delicious!! She and her husband kept saying how much it reminded them of her Mom’s cooking. Also made buttered noodles with parsley and fresh steamed green beans with the bread crumbs browned in butter. Our friend is going through chemo so she has enough left over for tomorrow’s dinner when she gets home from the hospital. Thanks for a wonderful recipe!! Thanks so much, Bob. I’m so glad you were able to enjoy a delicious German meal with your friends and family. God bless your friend in her journey towards recovery. Question, do you think this could be adapted for a slow cooker? I love this recipe but am trying to find ways to prep for the work week! Hi Laurel, most of the flavor of this dish comes from the process of sauteing, caramelizing and making the roux with the flour – all steps that will be missed in the slow cooker. If you’re going to employ a slow cooker for this I’d recommend waiting until Step 5 and transferring everything over at that point to slow cook on LOW for maybe 3-4 hours. But for this particular dish I recommend sticking with the stovetop. Thank you for this recipe! Made it tonight for Reformation Day celebration and everyone loved it. I probably used more butter than you suggested (and that SURELY didn’t hurt :-) ) We went with the egg noodles… cooked the pork, mush and onions in cast iron and it came out fantastic. This one is going in the rotation. Next time we’ll have time to go with the proper spaetzle! I made this the other night. Everything was coming along perfectly until the part where I added the bullion cubes. The cubes weren’t breaking up, and combining with the sauce, so I continued whisking. Unfortunately, I whisked so long that my sauce began to separate, and the bullion cubes still weren’t completely dissolved. I went ahead and added the pork/onions/mushrooms back to the sauce, but it was a mess. We ended up eating it. It didn’t taste terrible, but I’m sure it would have been better if the sauce had stayed together. Long story short: I am going to make this again, but I am going to crush the bullion cubes before I add them to the sauce. Otherwise, great recipe! Hi Sean, sorry about the ordeal you had with the cubes – that’s unusual for them not to have dissolved, it’s sounds like they were really hard! Yes, either crush them or you can also find powdered bouillon that you can scoop. Do give it another shot, this is such good comfort food! Kimberley, Love these recipes and the raving reviews! My husband grew up with German neighbors and they taught him to love German Cuisine! Can’t wait to try these recipes! Roulades are his absolute favorite! Do you have a recipe that you could share? Thank you, Michele! Rouladen are my favorite, too. I haven’t yet published my recipe for them but it’s coming! Wow! This was just great. I had this 40 years ago in Basel as a starving, back-packing American tourist. I remember how great it was (probably with veal, while I used pork) and I used noodles rather than rosti or spaetzle. I’m so happy to hear that, Michael, thank you! I’ve made this several times and only noticed now (because I’m making this today and needed to look at the recipe) that I have yet to rate this recipe. The only alternation I make is that I only make the sauce (no pork added). I use it to put over my spaetzle (Kimberly’s recipe) and schnitzel (again, Kimberly’s recipe) 😋 My hubby and two boys love it and completely devour their meal! I’m so happy to hear that, Sabine, and really appreciate the feedback, thank you! Wow. I made this on Sunday, and it was absolutely delicious. Quite possibly the best comfort food ever. I served it over your Spätzle (way better than the recipe I had been using) and it was a massive hit, even with my teen who doesn’t love mushrooms. This is definitely going in the regular rotation. Easy prep, goes together quickly, and so, so, good! That’s wonderful, Molly, I’m so happy to hear that, thank you! I had a ‘snow day’ off work today, so decided to dress up our spaetzle (we usually just eat it hot with cottage cheese melted into it). I am so glad I found this, because I can’t imagine eating that lovely pasta withOUT this now :) Hubby and I both loved it, thank you! Wonderful, Angela, I’m so glad you both enjoyed it! It’s one of my very favorites, too. Thank you! This is a wonderful comfort food dish for dinner on a cold night. The flavors are so rich and delicious. Easy to make and it taste better the second day. I served this dish over homemade spatzle which was great and red cabbage on the side. I highly recommend this dish if you enjoy German food. You will not be disappointed with the flavors! Thank you so much, Brenda, I’m glad you enjoyed it! Just made this last night – so yummy! I did add some smoked paprika and Worcestershire sauce, also had to de-glaze the pan at one point with a little white wine, but in the end, this was SO DELICIOUS! Like a hug on a plate! Thank you! I’m so glad, Julie, thanks for the feedback! This recipe is a winner. I used bacon and creme fraiche rather than pork and cream. Worked out great! It was fun to make too! Fantastic, James, thanks for the feedback!